This handy size pours nicely and is often selected by those who use honey as their primary sweetner. Great for refilling the bear, angel and / or honeybee plastic squeeze container. 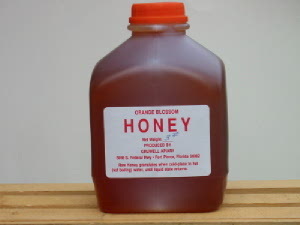 Try our 3 pound jug of either Orange Blossom, Wild Flower or Brazillian Pepper Gruwell Apiary Raw (unfiltered and unheated) Honey.